After chasing the defeated German Army across France and Belgium, the US Army ran into the strongly-fortified Siegfried Line just inside the German border. In the shelter of the "West Wall," as the Germans called it, shattered divisions turned to fight while the Americans threw their best formations at them. 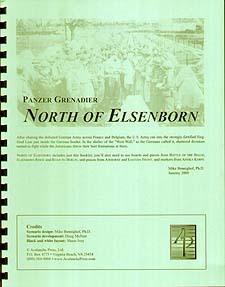 North of Elsenborn includes just this booklet; you'll also need to use boards and pieces from Battle of the Bulge, Elsenborn Ridge and Road to Berlin, unit pieces from, Airborne and Eastern Front, and markers from Afrika Korps.